Brad (January 16th): I have put some thought into this dilemma. It is fantastic. Beautiful. Something to be cherished ... I wish I had thought of it. Brad (July 30th): I'm cutting it. Back in 2009, I was having problems with my Cardassian Capture deck. Thanks to Evek (Agent of Cardassian Justice) and other cards, I had no trouble taking any captives; I just had trouble getting the exact captives I needed to help my deck work better. Instead of trying to improve the deck with existing cards, I had a better idea. I was going to use the opportunity I had, as a member of the design team for Peak Performace, to pitch a card to improve my deck. Why bother going to the hassle of looking through over 1,000 existing cards to find a solution? I was going to save myself time by designing one that did exactly what I needed. Take a personnel you command from an opponents Brig (they join this attempt), and your opponent chooses a different personnel to be placed in his or her Brig. This led to the first half of the infamous quote. To put it into context, Brad doesn't praise a lot of card pitches - at least, he rarely praised any of mine. Of all the ideas I pitched for Peak Performance, I only received this sort of praise for two (the other one being what would become Exchange Program.) I was thrilled. Not only because I evoked that response from someone who had a lot of experience in card design, but also because it meant the card had an excellent chance of making it to the final product if Brad liked it. Your opponent chooses a personnel you command in his or her brig and that personnel joins this mission attempt. When this happens, your opponent may choose a different personnel to be placed in his or her brig. "Sounds like he wants to trade two low-ranking prisoners for two more valuable ones. Would you make a deal like that?" A week later, Brad dropped his bombshell. He wasn't completely happy with Prisoner Exchange, and he wanted to move it to the next expansion to give him more time to think about what to do with it. I was devastated, but having the stiff upper lip that is expected of everyone in England, I didn't let on. I did create a stuffed effigy of Brad, and began sticking it with needles - but who wouldn't have done that? This was the story of my desire to improve my Capture deck. Not only did it result in a fantastic card (for my deck at least...), but it also gave me a funny quote to put in my signature, even if I had to take a little artistic license with it. As for the dilemma itself, it is really simple. 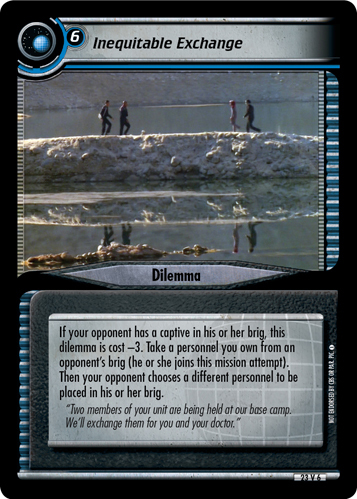 If you do have one or more captives in your brig, you can play the dilemma for 3 cost to let your opponent take one captive of their choice from your brig and have them join the mission attempt. Then, you get to look through all the other personnel in that attempt and choose one to be captured. If you don't already have a captive, you can just play the dilemma for 6 cost to look through all the personnel in the attempt and choose one to be captured. It's that simple. My improved Capture deck and I will see you at a future tournament.